A newly revised and updated Level One picture book in the award-winning Let's-Read-and-Find-Out Science series about sound and sound waves. Sounds are all around us. Clap your hands, snap your fingers: You're making sounds. Read and find out how people and animals use different kinds of sounds to communicate. 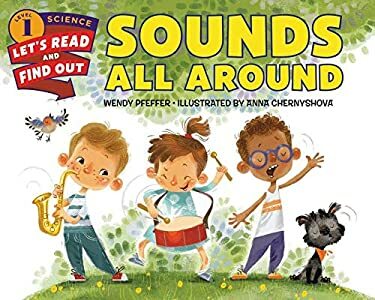 With colorful illustrations from Anna Chernyshova and engaging text from Wendy Pfeffer, Sounds All Around is a fascinating look into how sound works! Featuring rich vocabulary bolded throughout the text, this brand-new edition of a 1999 title includes brand-new illustrations by Anna Chernyshova. This book also includes a Find Out More section with additional and updated experiments, such as finding out how sound travels through water. Both the text and the artwork were vetted by Dr. Agnieszka Roginska, Professor of Music Technology at NYU. This is a Level 1 Let's-Read-and-Find-Out, which means the book explores introductory concepts perfect for children in the primary grades and supports the Common Core Learning Standards, Next Generation Science Standards, and the Science, Technology, Engineering, and Math (STEM) standards. Let's-Read-and-Find-Out Science is the winner of the American Association for the Advancement of Science/Subaru Science Books & Films Prize for Outstanding Science Series. Sounds are all around us. Clap your hands, snap your fingers: You're making sounds. Read and find out how people and animals use different kinds of sounds to communicate. With colorful illustrations from Anna Chernyshova and engaging text from Wendy Pfeffer, Sounds All Around is a fascinating look into how sound works! Featuring rich vocabulary bolded throughout the text, this brand-new edition of a 1999 title includes brand-new illustrations by Anna Chernyshova. This book also includes a Find Out More section with additional and updated experiments, such as finding out how sound travels through water. Both the text and the artwork were vetted by Dr. Agnieszka Roginska, Professor of Music Technology at NYU. This is a Level 1 Let's-Read-and-Find-Out, which means the book explores introductory concepts perfect for children in the primary grades and supports the Common Core Learning Standards, Next Generation Science Standards, and the Science, Technology, Engineering, and Math (STEM) standards. Let's-Read-and-Find-Out Science is the winner of the American Association for the Advancement of Science/Subaru Science Books & Films Prize for Outstanding Science Series.